Thus begins an atypical day at work. I’ll be perfectly frank: I had completely lost any and all faith in Disney’s ability to make a good, non-Pixar non-Ghibli animated film. However, my friend pointed me in the direction of Paperman, winner of the 2012 Oscar for Best Animated Short Film. Paperman is a silent romantic comedy follows a typical office worker of yesteryear and how, with the aid of paper, he falls in love. 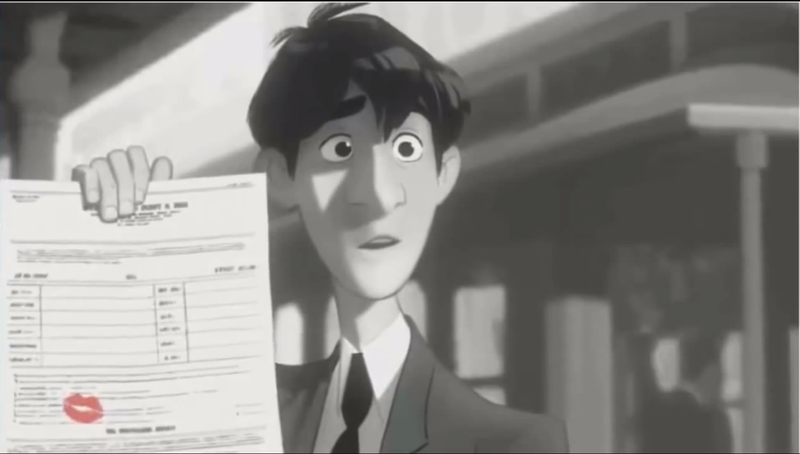 Much like how Skyfall really embraced its James Bond roots, you can tell Disney was absolutely itching for a chance to show off its pride of having been the world’s top producer of animation once upon a time, and it did so with Paperman. Paperman was animated using a hybrid of traditional cel animation and computer graphics. The fact that the movie was (with exception) black and white and adopted a 1940s setting shows a clear nostalgia for Disney’s glory days. Not only that, but the movie’s visual look was absolutely gorgeous. With a movie that was less than 7 minutes long, there isn’t a ton to say. However, Paperman completely mastered the art of “showing, not telling” and was exactly all I needed in order to say, “Aww”. In less than 7 minutes, Paperman has single-handedly restored my faith in Disney as an animation giant that is dependent on neither Pixar nor the fact that it owns the right to distribute Ghibli movies in America. Sorry I’ve been so absent!! 😦 Lots of things been going down for me off-net. Miss seeing your tweets to me! My commenting here better late than never, I hope. Funny how when I finally make it to your page, I’ve found that you’ve reviewed a recent short that I really enjoyed. In fact, I liked it so much I bought it in its singular form off of iTunes. I completely agree with your show not tell comment, though I’m not sure if I can go so far as to say it’s restored my own faith in Disney. A glimmer of hope, maybe, but depending on their next moves, it could go right back down south again very quickly. I hope Disney can make more movies like this. I think the problem with them was that they had taken a “quantity over quality” approach when they started releasing direct-to-video type animated movies by the truckload and assumed little kids would convince their parents to buy them movies like Lion King 1.5. It was as if they stopped caring about making movies for the theater anymore, and instead relegated that to Pixar to make more Academy Award-winners (which seems to be fizzling out even for Pixar) or to Ghibli (Again, Disney is in the comfy position of owning the rights to distribute Ghibli movies in the US).